Today is oregano drying day at the Walliser house. Every May I head out to the garden to harvest fresh oregano sprigs. The timing is crucial because if I cut them too early, the flavor isn’t quite up to snuff, but if I cut them too late, four-lined plant bug damage has marred the beautiful foliage and the flower buds have already developed. Early to mid-May seems to be the perfect time for drying oregano. Here’s how I go about drying oregano. Oregano is an easy herb to grow and dry. First, I head out to the garden with a sharp pair of herb scissors. I gather a large handful of tender, green shoots with my left hand and cut them with my right, making sure the cut ends of the stems all line up. I give the handful of oregano a few quick, brisk shakes to dislodge any insects and debris, then I wrap the base of the stems with a rubber band. I continue this process until I have six or seven bunches. We go through a lot of oregano in the winter, and I never like to run out of homegrown herbs! Once the bunches are inside, I unfold one paperclip for each bunch and use the paperclip’s “S” as a hook, sliding one end under the rubber band and using the other end to hook the bunch of oregano to its drying location. I extend a piece of jute twine from one side of my kitchen window to the other, fastening it securely to a tea cup hook I installed on each end of the window frame. Then I hang the bunches up on the twine, placing them a good five or six inches apart to allow for good air circulation. 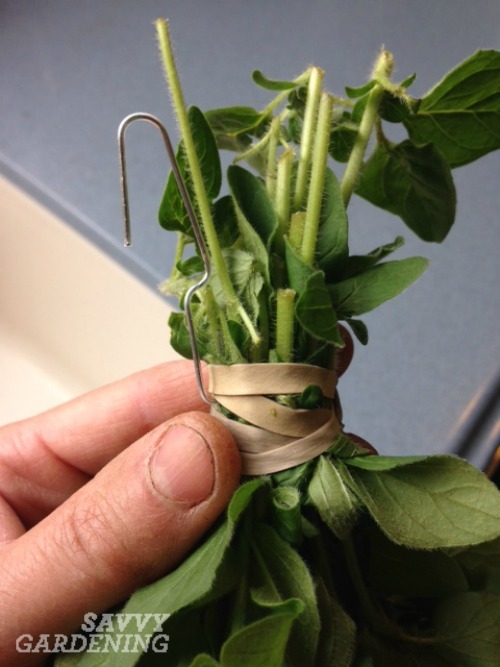 I use an unfolded paperclip to make a hanger for my herb bunches. The same drying line also serves to dry thyme, basil, parsley, and other herbs later in the season. If I’m only drying a few bunches of herbs, I’ll hang them directly on the tea cup hooks, rather than installing the jute twine. My drying oregano is ready in four to six weeks; sometimes sooner if the weather isn’t overly humid. Once they’re fully dried, I cut off the rubber band, separate the dried sprigs, and crush the leaves. I store my crushed oregano in a Mason jar in a dark cupboard. 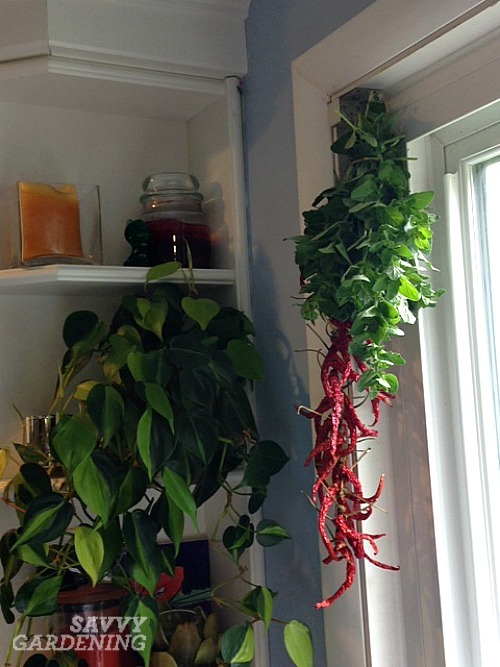 A bunch of drying oregano hangs at the corner of my kitchen window with part of last year’s Thai chili pepper crop. 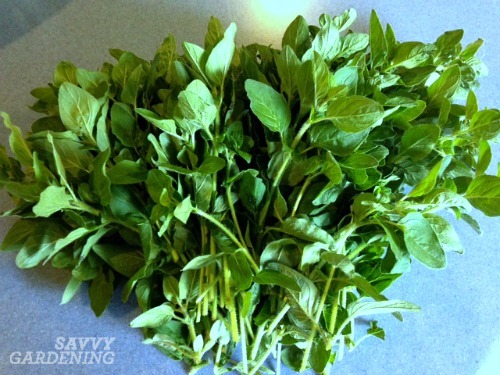 Are you drying oregano or other herbs this year? Thanks for the tip on the oregano. A friend gave me a great tip for parsley. All you need to do is cut off the leaves (I use the flat leaf parsley) place it in a food processor to chop it into quarter inch size pieces and put it in a plastic container and directly into the freezer. It’s ready to go into any dish – hot or cold. I’ll have to try your parsley tip, Maddy. Thanks for the great idea! Can oregano only be cut once a year or does it keep growing? If it flowers can it still be harvested? Thanks for the blog! Oregano can be harvested several times throughout the spring, but flowering will cause the flavor to be slightly altered. For that reason, I don’t recommend harvesting after the plant comes into flower.